It started to swell immediately and looked, well it was big. So I went to the hospital and all they did is they started to pump antibiotics through my veins. Now, after 2 days I am out again, but the Dr wanted me to keep on swallowing antibiotics this time in a form of pills. Now my questions is: Do If really need to do that? And what would be the most efficient way to to help my body recover from the poison? If you can share your take on this with me it would be much appreciated. If there is immediate swelling, then this is indicative of severe bruising of the thigh muscle, breaking blood vessels, resulting in bleeding into the muscle belly. In your case, it would appear that you have had a lot of blood flood into the thigh tissues. 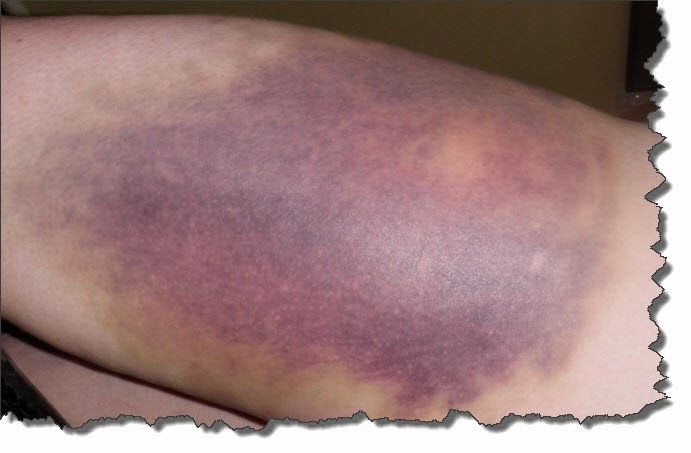 This is called a haematoma (Refer photo below of an older haematoma following a fall off a bicycle and one which was poorly treated at the time). Poorly treated, large volumes of blood can be lost into the thigh, leading to generalised weakness, fatigue and a very long recovery of full leg strength and function. In your case, so long as there was no broken skin, risk of infection is as good as nil. Swelling that is immediate following trauma is from bleeding - not infection. Swelling from infection happens several hours or days after, not within minutes of the trauma. I can't see any justification for prescribing antibiotics; but is there is a detail I am missing here? The purpose of the following measures is to minimise blood flowing into the damaged area and blowing the thigh up like a balloon. The less bleeding, the quicker and less complicated the recovery. Stop exercising and lie flat with the injured leg higher than the chest, so that blood pressure into the leg is lower than if lying with the leg down, or standing (If you have fallen off a bike, then you will probably be in this position to start with). Press with a flat hand firmly onto the region of the thigh that took the blow and hold there for at least 10 minutes (This is so as to prevent blood gushing into the damaged area and it takes several minutes for the blood to begin to clot and seal the damaged blood vessels. If possible, apply a compression bandage to the entire thigh with a firm pad (could be a glove) over the area that took the blow. It is possible to further reduce the bleeding by pulling the ankle to the buttock so that the thigh is placed in a gentle stretch. The tension on the muscle prevents blood flowing in and swelling the muscle (very effective!). Release the stretch now and then to prevent any cramping. Ensure you keep warm and have a little to eat and drink, if needed. After about 20 minutes, by which time the bleeding risk is much less, you may get up and struggle home, but try to avoid too much movement and try to keep the leg elevated and with compression to the thigh. Once home, keep the leg elevated and compressed. Ensure the entire thigh from knee to groin is bandaged because blood will leak along the muscle muscle and tendon compartments. Take lots of Reparen, vitamin C, zinc and antioxidants and do so for as long as there is bruising and swelling (consult a suitably trained health professional about exactly what to take and how much). This will expedite full recovery. Please consult a health professional who has experience with these injuries. Recovery will be quick and without complication, given that you have more or less followed the guidelines above.